A guide to finding and using printed and digital maps. Welcome to the Maps guide. Use the tabs above to explore our resources. The University Library has a collection of about 70,000 maps and atlases. The majority of maps are reference only, but there is a Field collection on the 4th Floor which can be borrowed with your Campus/Library card. Atlases are mostly on the 4th Floor and can also be borrowed. Atlases with the call number 'Oversize MF' are shelved separately on the 4th Floor. If you need to consult maps please contact Judith Fox, the Map Librarian. She can advise on the types of maps available and guide you to the ones most suited to your needs. Tuesday 13:00-14:00; Wednesday 14:00-15:00; Thursday 13:00-14:00. 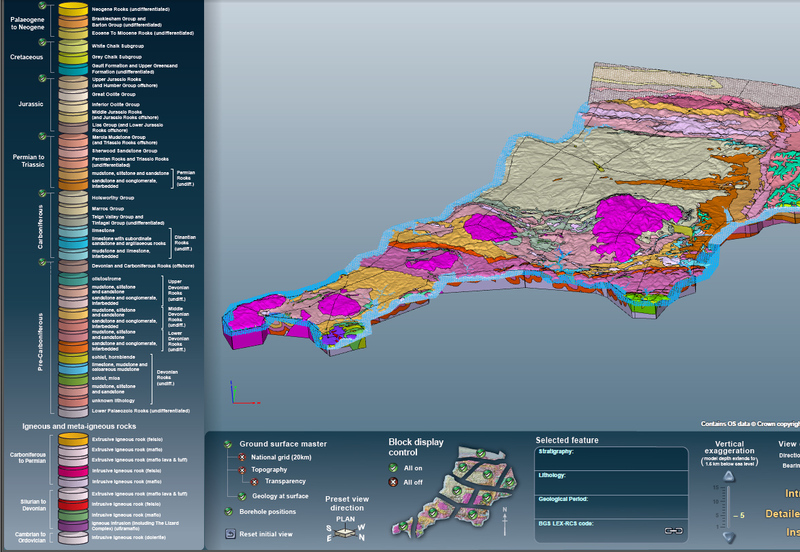 This map of the southwest of England was created using the British Geological Survey's Regional geological visualisation tool. The 14 regional areas of England, Wales and Northern Ireland are included and the tool provides interactive 3-D visualisation, with optional topographic features. This allows exploration of the diverse geology of the UK to depths of 1.5 km below the surface.